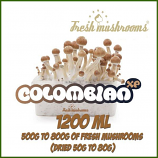 The Psilocybe cubensis Colombian is very popular for its strong effect, easy growth and abundant harvest. It is also known as a "social mushroom" since it provides more social interaction for most people. Rather than creating extreme visual effects, this mushroom offers a more philosophical experience. 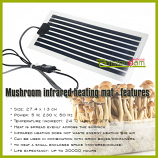 It is considered to be one of the most powerful mushrooms. Despite the strong effect of the Colombian, it is also suitable for beginners. If you would like to try a powerful and philosophical experience, choose the Colombian!